Black and white: a timeless combination that will never go out of style! From tuxedos to patterned bathroom floor tiles to the printed pages of a book, the juxtaposition of black and white calls to mind ideas of sophistication and refinement. These beautiful two-toned kitchen designs take advantage of the luxurious, polished, and refined aesthetic of a black and white interior colour scheme. These architects and designers bring you the best in high-quality materials and modern design. If you're updating your kitchen in the new year, take note! These stylish kitchen designs offer up a classic colour palette that will still be style for years to come! This black and white kitchen follows a Scandinavian aesthetic. 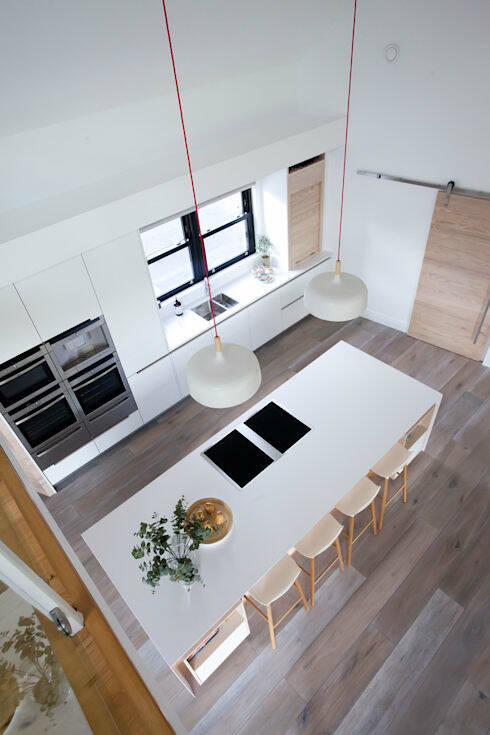 You find hints of this style in the natural wooden floors, the light colour palette, pops of high contrast colour, and emphasis on smooth surfaces and lightweight materials. This kitchen is offers up more white than black, but black still makes a mighty statement in the stove top, quadruple oven segment, and crisp black window frame. Curious about Scandinavian style? This feature might interest you. This polished space brings about the feeling that you're standing in a penthouse in a glamorous city somewhere. 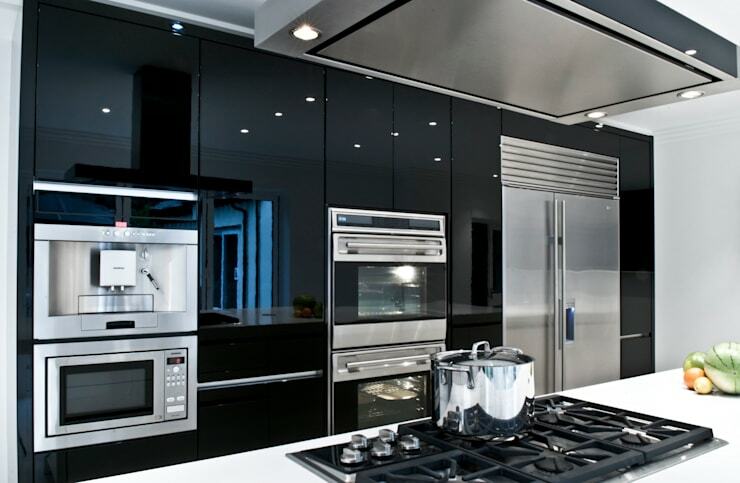 This black and white kitchen is characterized by high-gloss finishes and high-contrast arrangements, with stainless steel shining next to seamless black cabinets. 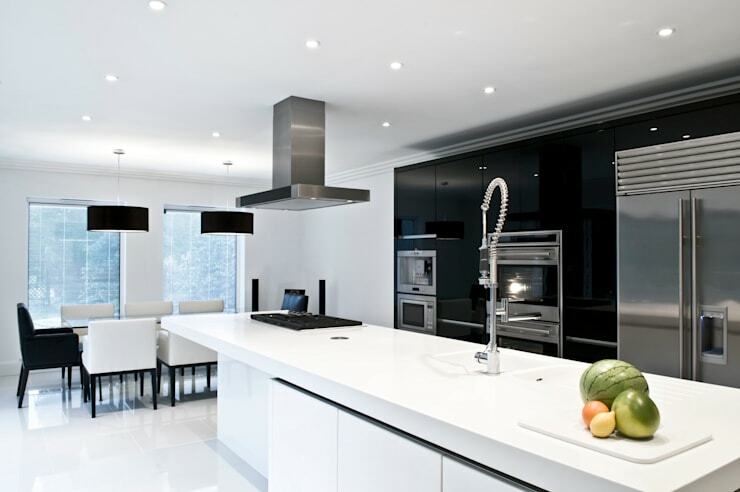 The white kitchen island provides a light balance for the expansive black walls of this daring design. … and black and white dining room, too! Not only does this kitchen offer a scene of crisp contrasts, the adjacent dining room carries on the theme! The dining room table takes on a checkerboard appearance with pops of black in the lamps, singular black chair, and legs of the white chairs. A lovely scene where the black mingles with white in a more playful manner, as opposed to the kitchen, which keeps these colours starkly separate. This artistic kitchen offers a scene filled with retro-inspired items, only they've been given a modern twist. The glass chandelier and subway tile wall are two of these old-school elements that have received a modern makeover, exhibiting a brand new, polished appearance. This black and white kitchen offers a highly dynamic space where reflections are spread across the many polished surfaces, creating a dazzling visual feast! 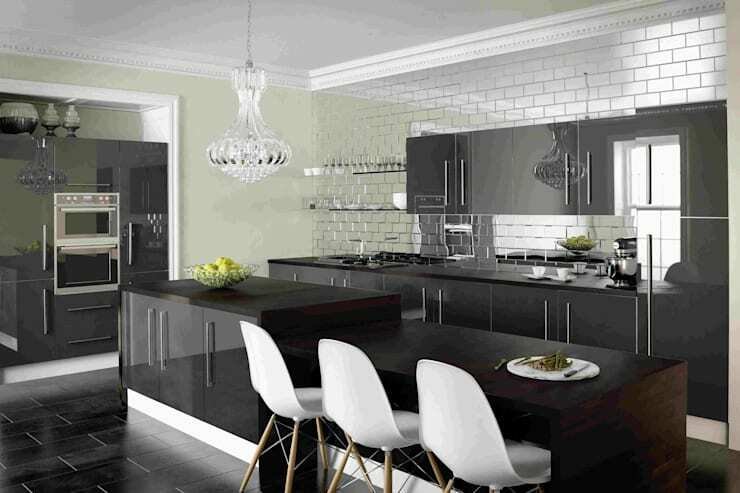 This kitchen is proof that a black and white colour scheme can also be subdued and relaxing. With a rich, chocolatey array of floor-to-ceiling cabinets on the left and a swirling marble floor gliding underneath, this kitchen instantly takes on a fluid, decadent feel. Combine this with the soft light coming through the gauzy curtains, and this black and white space becomes a dreamy, airy delight! What's your take on these kitchen designs? Comment on these black and white kitchens below!